During 2010-11, four Leadership and Policy Roundtables met regularly to work on goals and policy agendas related to their topics, and to provide a forum for peer learning and networking. The Roundtables were comprised of staff and board members from organizations involved in the Project, and were led by the Homeless Youth Capacity Building Project staff. Following is a description of the Roundtables and some of their accomplishments. This Roundtable, led by Debbie Raucher of the John Burton Foundation, focused on bringing the interests of homeless youth to the forefront of the Permanent Source Campaign, an effort to identify a permanent source of funding for housing development in California. In recent years, considerable progress had been made with the introduction of California Senate Bill 500 by Senate President pro tem Darrel Steinberg. In addition, the California Department of Housing and Community Development prioritized the development of a permanent source, estimated to rise to $2 billion annually. The Roundtables goals were twofold: to support the broader effort to pass permanent source legislation as well as to ensure that the interests and needs of homeless youth and youth providers are represented in the legislation. This Roundtable, led by Amy Lemley of the John Burton Foundation, involved participants in discussions around the implementation of Assembly Bill 12, The California Fostering Connections to Success Act (Beall), signed by Governor Schwarzenegger in September 2010. This law, beginning January 2012, allows California to access federal funding to extend foster care eligibility to youth until age 21. Roundtable participants attended AB 12 stakeholder meetings and provided input that was included in recommendations produced by the John Burton Foundation for the California Department of Social Services (CDSS). This Roundtable, led by Heather Dearing of the California Coalition for Youth advocated for the increase of the federal appropriation of the Runaway & Homeless Youth Act. The federal government’s primary strategy to address youth homelessness is through the Runaway and Homeless Youth Act (RHYA) administered through the Family and Youth Services Bureau (FYSB) of the US Department of Health & Human Services. The RHYA provides funding for emergency shelter, transitional living and street outreach programs. Despite the cost-effectiveness of RHYA programs, their funding levels have remained relatively static and meet only a fraction of the total need. The goals of this roundtable were to build RHYA funding expertise, advocate for increased appropriations for RHYA, and advocate for California to receive a proportional share of federal funding based on population/service data. This Roundtable, led by Heather Dearing of the California Coalition for Youth developed a policy brief called “California Emergency Youth Shelters Ensuring Services to Better Protect and Serve Homeless Youth”, later resulting in Senate Bill 119 (Lowenthal), which would create a licensing category for emergency youth shelter facilities. This was in response to the following: California emergency youth shelters are required to be in compliance with state and local licensing requirements. The Community Care Licensing Division (CCLD) of the California Department of Social Services offers licensing and monitoring to children’s residential group homes, but not explicitly youth emergency shelters. These regulations are designed to regulate group homes, which are long-term out-of-home placements (non-voluntary) for youth in protective custody (foster care, etc.). Emergency shelters for children and youth are designed to provide voluntary and temporary shelter to youth who are homeless or at risk of becoming homeless. To comply with state and local licensing requirements, youth shelter providers must receive a number of exemptions from CCLD in order to obtain a license. Additionally, there are a growing number of agencies which provide services to transition-age youth, offering care to youth as young as 16 and extending care to the age of 21 or 24, which raises questions about the current regulatory body for these providers, and whether existing practices best meets the needs of this population or the providers who serve them. This Roundtable explored existing best practice regulation standards in local communities and other states, researched and documented implementation of CCLD activity and existing exemptions for youth shelters in the seven Project counties, developed a standard of care for youth shelter providers, and advocated for the development of a new regulations category for youth shelters to be administered by Community Care Licensing Division or an alternative statewide authority. For information about the current status of SB 119, contact Heather Dearing at heather@calyouth.org. 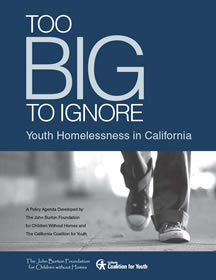 The report outlines a comprehensive policy agenda to reduce youth homelessness in California, and drove the development of the Homeless Youth Capacity Building Project. Learn more about the policy agenda and the 2009 publication “Too Big Too Ignore” here.